The unconscious mind is thought to be a deeper part of a person's mind that works without that person knowing it. Feelings, thoughts, desires or emotions appear to come out of nowhere, leaving the person to question where they came from. The unconscious mind is a term coined by the 18th century German romantic philosopher Friedrich Schelling and later introduced into English by the poet and essayist Samuel Taylor Coleridge. It is, however, an ancient idea which has been noticed in many civilisations and cultures. Also, whether other mammals have similar mental mechanisms to man is also a question with a considerable history. An iceberg is often used to illustrate Freud's theory that most of the human mind operates unconsciously. The unconscious mind plays a large role in Sigmund Freud's psychoanalysis. He discussed the importance of the unconscious mind in understanding conscious thought and behaviour. However, the unconscious was not discovered by Freud. Historian of psychology Mark Altschule concluded, "It is difficult—or perhaps impossible—to find a nineteenth-century psychologist or psychiatrist who did not recognize unconscious thought as not only real but of the highest importance". Freud's advance was not to uncover the unconscious but to devise a method for systematically studying it, though his method is as controversial as the rest of his ideas. Freud called dreams the "royal road to the unconscious". This meant that dreams illustrate the "logic" of the unconscious mind. 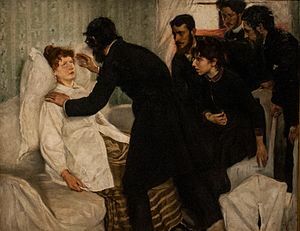 Freud developed his first topology of the psyche in The Interpretation of Dreams (1899) in which he proposed that the unconscious exists and described a method for gaining access to it. The preconscious was described as a layer between conscious and unconscious thought; its contents could be accessed with a little effort. One key feature of the unconscious is 'repression'. Freud believed that many people repress painful memories deep into their unconscious mind. The adaptive unconscious is a set of unconscious mental processes influencing judgment and decision making. It is different from conscious processing: it is faster, effortless, more focused on the present, but less flexible. In other theories of the mind, the unconscious is limited to "low-level" activity, such as carrying out goals which have been decided consciously. In contrast, the adaptive unconscious is thought to be involved in "high-level" cognition such as goal-setting as well. ↑ Bynum; Browne; Porter (eds) (1981). The Macmillan dictionary of the history of science. London. p. 292. ↑ Altschule, M (1977). Origins of concepts in human behavior. New York: Wiley. pp. 199. ISBN 0470990015 .